" Haazir & Naazir "
“Haazir (Omnipresent) and Naazir (Omniseeing) are the sole attributes of Allah. No human being including our Nabiy (Sallallaahu Alayhi Wasallam) cannot be Haazir and Naazir. Our beloved Rasul (Sallallaahu Alayhi Wasallam) is resting in Madinah Munawwarah. 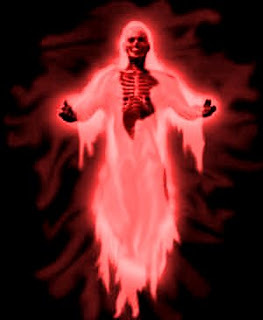 He informed us that when anyone sends Salaams to him, the angels convey the Salaam to him there." The Divine Attributes are divinely ordained and non-inferable. 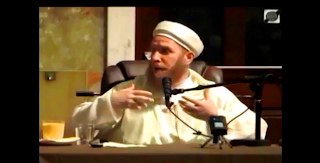 Logic, reasoning, analogy, and other forms of interpretation are not relied upon to know an attribute but only Divine disclosure through the primary two sources of the Shari`a i.e. Qur'an and Sunna. 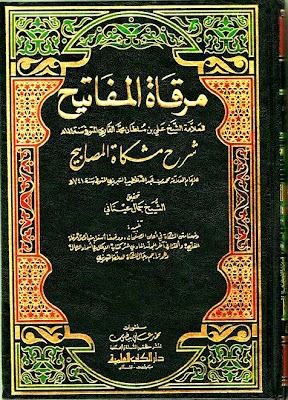 This is an elementary point of `aqida that is present in most if not all books of `Aqida, including the Maturidi classics. 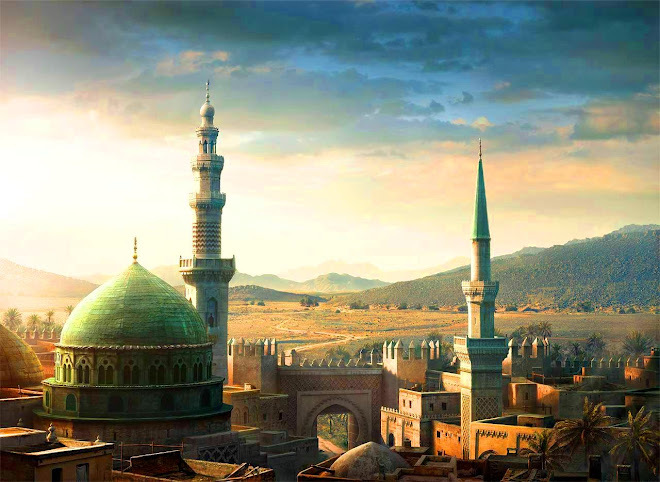 So we cannot speak of al-Hâdir, while al-Nâzir is the same as al-Basir and al-Shahid. As for al-Hâdir it is precluded, because Hâdir in Arabic has the sense of a being physically present at a location, i.e. attributes of the created not the Creator. And Allah knows best. Haadhir Nadhir does not mean that the Prophet [May Allah bless him and grant him peace] is present. Rather, it means that the Prophet [May Allah bless him and grant him peace] views the actions of his Ummah whilst he is in his grave. 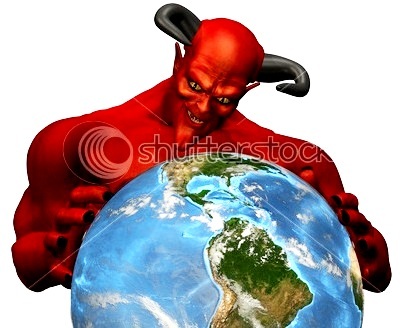 He can go from his grave to other places where he likes spiritually. He prays for us. "After some research, we have found that the Barelwis do hold the view that our Nabi [sallallaahu alayhi wasallam] is Haazir and Naazir and he [sallallaahu alayhi wasallam] directly witnesses every action of every person. It is stated in the Hadith that Allah has appointed certain angels who convey all the information of the world to Nabi [sallallaahu alayhi wasallam]. This Hadith will then be meaningless in the face of the belief that Rasulullah [sallallaahu alayhi wasallam] witnesses every action of every person. So, when a Muslim dies and leaves behind wealth, his family will be the heirs of that wealth. But if he leaves behind debts or orphans, let them come to me for I am their Maula There is no believer but I am the Master of his life more than him in duniya and aakhirah But if he leaves behind debts or orphans, let them come to me for I am their Maula (guardian)." Haazir (Omnipresent) and Naazir (Omniseeing) are the sole attributes of Allah. in Madinah Munawwarah. He informed us that when anyone sends Salaams to him, the angels convey the Salaam to him there. "NANOTWI ^HAD COME TO ME IN HIS ORIGINAL BODY"
Qari Tayab Sahib, Rector of Darul 'Uloom Deo-band narrates that in that period when Moulvi Rafi'uddeen was Principal of the Madressa, controversy existed between senior teachers of the Darul 'Uloom. At a later stage a senior teacher of the Madressa, Moulvi Mahmood Hassan also got involved in the controversy and the controversy extended. Now listen to the incident after this as explained by Qari Tayab. 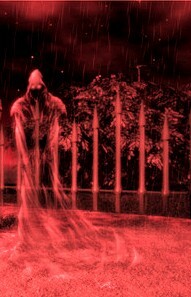 “This incident was a parable of the soul and it could be in two forms. 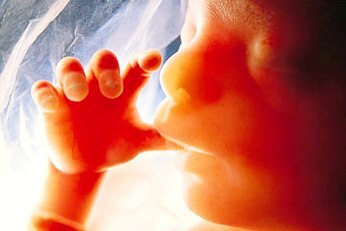 Firstly, that it was like a body but resembling external body. 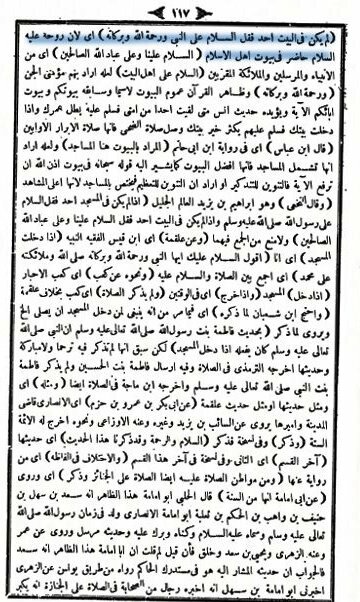 Hold fast to your seat, and be ready to read this hair raising incidence from “ Sawaneh Qasimi”, the biography of Mawlana Qasim Nanotvee, founder of Darul Uloom Deoband. The biography was written by the giant Deobandi scholar Mawlana Munazir Ahsan Gilani . The book was published by Darul Uloom Deoband itself as a mark of respect to their founder and Qari Tayyib , was honoured to have his name written as publisher. 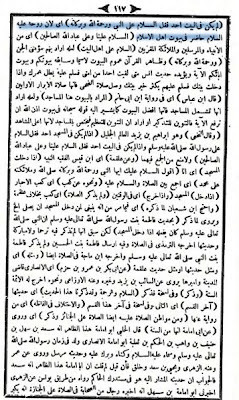 Mawalana Mamudul Hasan narrates about a young Mawlana who graduated from Darul Uloom Deoband and went towards the province of Punjab. The young Deobandi Mawlana was much tensed and thought that he is now about to lose his job (of Imam) as his knowledge is less and this new preaching Mawlana might give him lectures on Logic and tasawwuf. Having all these fear in mind, the young Mawlana still accepted the debate challenge. Date, time and place were fixed for the debate. On the appointed date the new preacher came with his magnificient turban on his head, with loads of books and his supporters. Where as, this poor Deobandi Imam with dull face, feeble voice, full of fear appeared remembering Allah. (Allah Allah kartey huaey samaney aaya). “ Yes, start the discussion, don’t fear”. With this assurance he got some comfort and power in his heart. The Deobandi Mawlana continued and said after this he was not aware what was coming out from his tongue. The preacher Mawlana did try to answer some question in the beginning, but then I saw that this preacher Mawlana stood up and placed his head on my feet, his turban was all scattered, he was crying and saying “ I did not know you were such a big scholar. Please forgive me for the sake of Allah. Whatever you are telling is truth and I was on fault”. Hazrat Shaykhul Hind (Mawlana Mahmoodul Hasan) asked that young Deobandi Mawlana about the appearance of the man who came and sat besides this young deobandi scholar.
" he was mawlana Qasim Nanotvi who came to help you". (From his grave)! First, look at how open heartedly this has been accepted by our Deobandi friends that Mawlana Qasim Nanotvee came to know the unseen as much as that he came to know that a Deobandi scholar is struggling and is in need of help at such and such place . Mawlana Qasim Nanotvee immediately walked towards him to help him. Thirdly, Deobandi scholars can come after their death to help their followers, but with regard to Prophets and Awliya, (Friends of Allah) this is not accepted! It says “And the truth of the matter is , what ever help human beings get in this world , Allah is providing this help thought His creations itself like brightness from Sun, Milk from Cow and Buffalo. This is a (authentic) narration, how can some one deny this”? 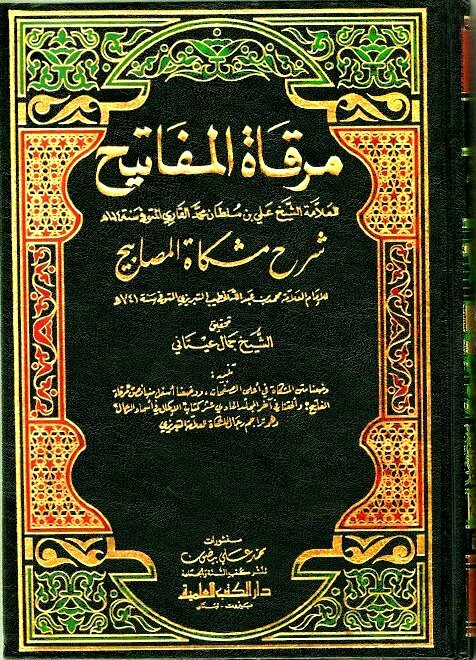 It seems Mawlana Manazir Ahsan Gilanai never had the chance to read Barhaney Qatiya written by his own group memeber Mawlana Khaleel Ahmed Ambethavee. 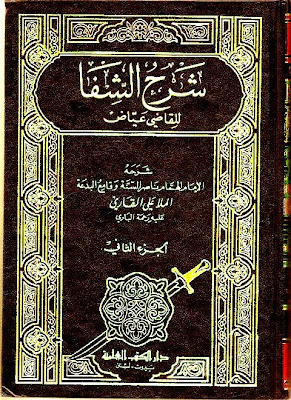 The book clearly states’: “that knowledge of the unseen possessed by angles of death and Satan is proved from Quran and Sunnah , but no such proof is available for Prophet ( sal allahu alaihi wa sallam) and any who thinks prophet had the knowledge of the unseen is in CLEAR SHIRK.!! Do we see this? When the super human quality of Mawlana Qasim Nanotvee is at stake, then all sorts of hadith and Quranic verses are brought to support their claim! When super human quality of Mawlana Qasim Nanotvee is at stake, all the logic and examples like cow and milk are used ,, just to maintain the high status of Mawlana Qasim Nanotvee. 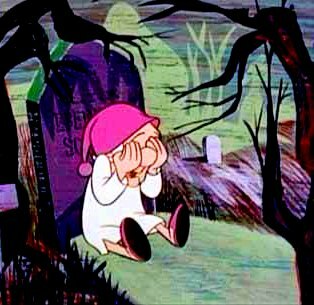 Where were all these quranic verses , hadith and examples when some of your scholars said that to get a thought of prophet is Salah ( prayer) is worse than getting the thought of Ox and Horse? Where were these hadith of Mearj when some of your scholar equated the prophetic knowledge of the unseen with knowledge possessed by animals and lunatics? Why did you not explain at that time, that the Knowledge of prophet is directly from Allah and Allah chooses to give the knowledge of the unseen to His most beloved prophet? We defend whom we love and what we think as truth. When the status of Mawlana Qasim Nanotvee was at stake , when it was to be proved that Mawlana can come from his grave, walk. freely and sit where ever he wants , that time it was said that ‘ Allah chooses spirits ( ruh) to help others” When it was to be proved that how Mawlana got the knowledge in his grave ( alame barzakh) that his follower is in problem it was said” Allah gave this knowledge”. But sad to share , some people show lack on interest in refuting those who have shown and still show disrespect to prophet. 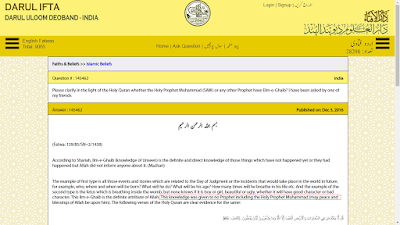 Go to any Deobandi and ask ‘did prophet have the knowledge of the unseen”? 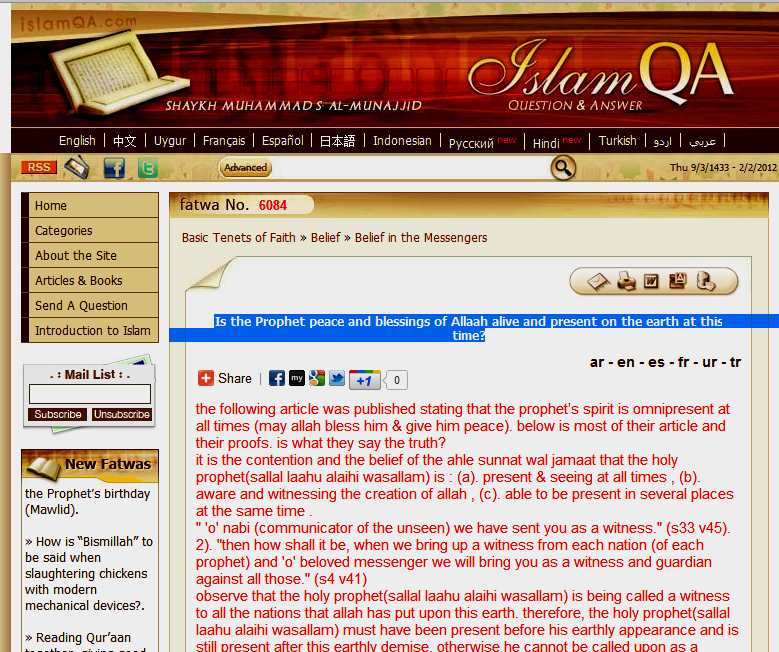 And you will get an answer“ Prophet had the most knowledge among all the creations”! 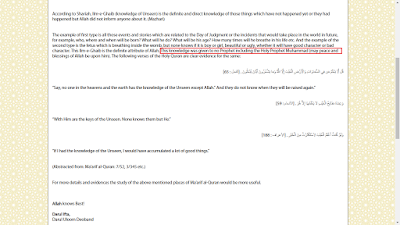 He will still not say that prophet had the knowledge of the unseen given to him by Allah. 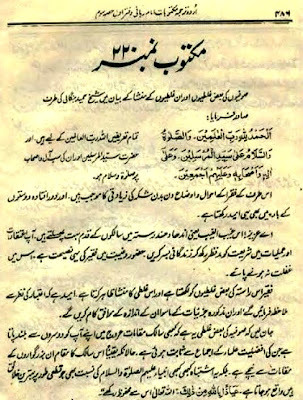 It is also important to see what the forefather of Deobandi group, Mawlana Islmaeel Dehalvee wrote in his famous book “Taqwiyatul Iman”. “Full filling wishes, removing difficulties, providing help at times of danger, all this belongs to Allah only and no prophet, awliya, spiritual guide, martyr, ghost or fairy can provide help of any sort. Anyone who makes a vow for them or remembers them at times of danger, he becomes a mushrik! Whatever be the belief, whether these people have self power to provide help or that THEY ARE GIVEN THIS POWER BY ALLAH, TO PROVIDE HELP, IN ALL CASES IT IS SHIRK! “If there is no-one in the house then say ‘as-salâmu ‘alâ al-Nabiyyi wa rahmatullâhi wa barakâtuh.’ because the soul of prophet, sall-Allahu `alayhi wa sallam, is present in the house of the Muslims (ay li’anna rûhahu ‘alayhi al-salâmu hâdirun fî buyûti ahlal islam). “as-salâmu ‘alâ al-Nabiyyi wa rahmatullâhi wa barakâtuh is (not) to be said because the soul of prophet, sall-Allahu `alayhi wa sallam, is present in the house of the Muslims, rather by reciting as-salamu 'alayna wa'ala 'ibadillahis saliheen [Peace be on us and on all righteous slaves of Allah] it is meant the prophets and angels." 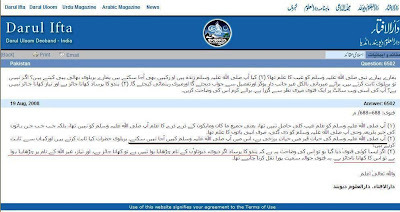 The deobandi maulvi wrote the correct Arabic text but fabricated the translation by adding extra “not” within the brackets, there by totally changing the meaning! 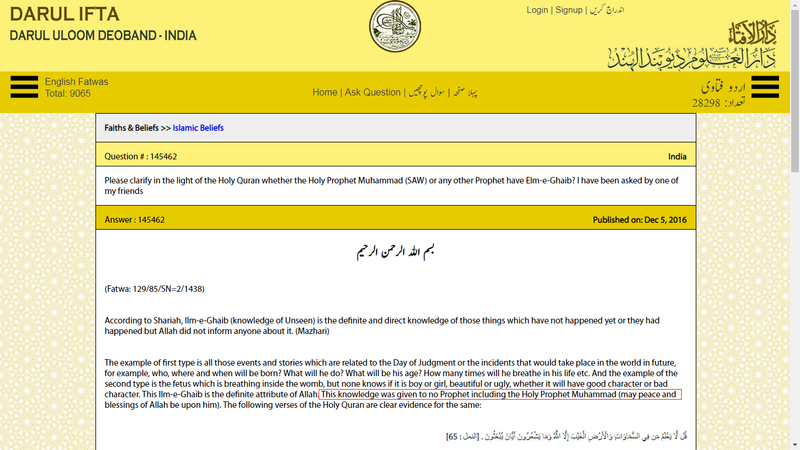 By inserting that additional word “not” (La in Arabic) maulvi Sarfaraz safadar al-deobandi has given the exact opposite meaning and shown his hatred towards the love and respect of Holy Prophet sal allahu alayhi wa sallam. Indeed this is the fabrication of the highest order! “In some copies the word “La” is missing! We ask these fabricators to produce any manuscript or printed copy of Sharah al –Shifa of Mulla Ali al-Qari to prove their claim! 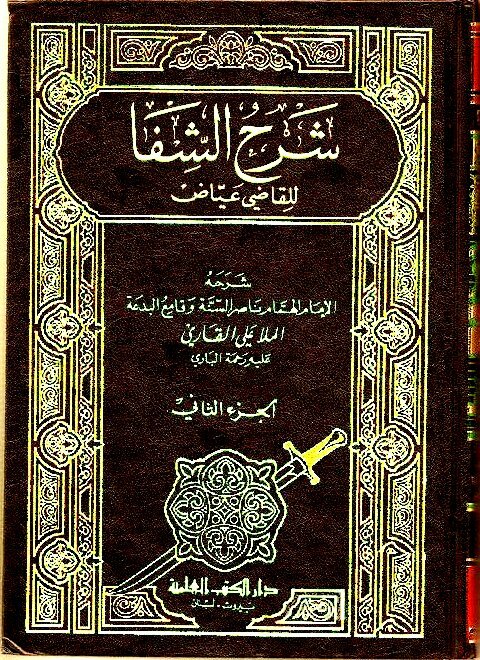 The truth is there is no such “la” in any manuscript or printed copy of Sharah al -Shifa. 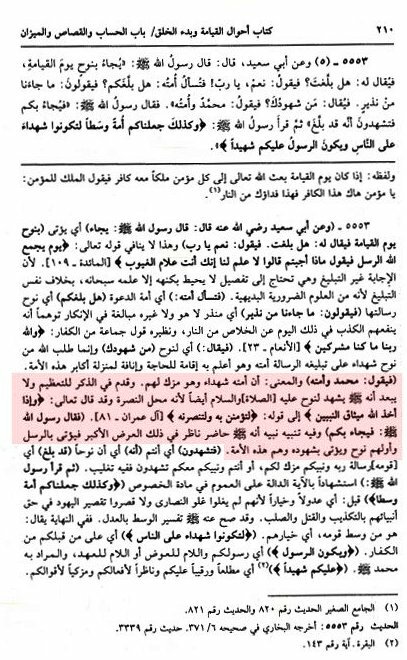 In this chapter Imam Rabbani Hadrat Mujadad Alf Sani (رحمة الله عليه) mentions how many sufis get Kashafats which are very dangerous for them, These kashafats make them think many wrong things which can be very dangerous for their iman. This is indeed a great trial for such sufis. 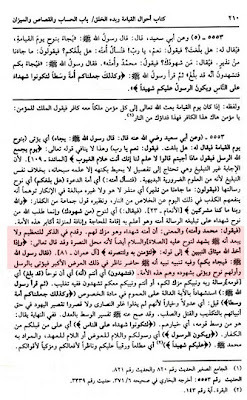 Imam Rabbani Hadrat Mujadad Alf Sani (رحمة الله عليه) mentions all such problems due to such kashafat and than says HE HIMSELF SUFFERED FOR LONG WITH SAME PROBLEM and there was no way out. 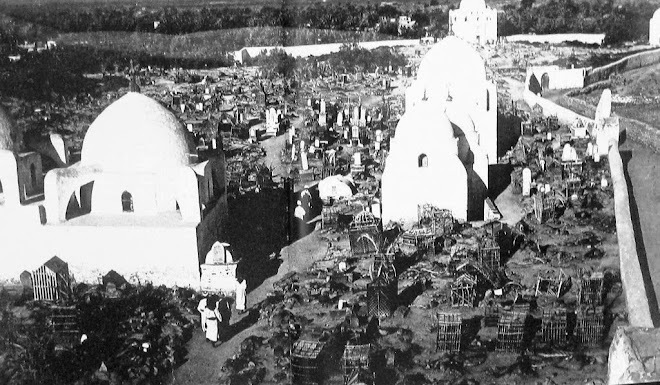 Quote Starts : Before this Waswafah [thoughts] used to get perished like soil in front of belief and had on value, In fact I used to do Tawbah and Istagfar and pray humbly that such Kashafats as not revealed. And that no kashafats should be revealed if they go against and principle of Ahlus Sunnah Wal Jammat. 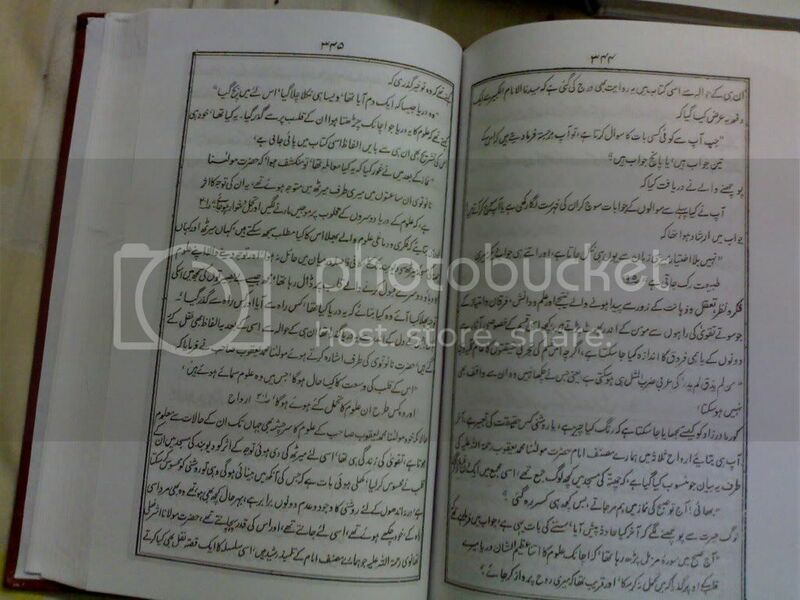 Volume 3 , Maktubaat # 220: to view pages Click: here. Moulvi Ashraf 'Ali Thanwi writes, "Muhammad al-Hazrami Majzoob was a possessor of amazing qualities and miracles. 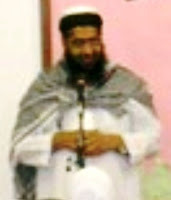 Once, he performed Jummah and gave Khutbah in 30 cities at the same time. He could be present in many cities in the same night". 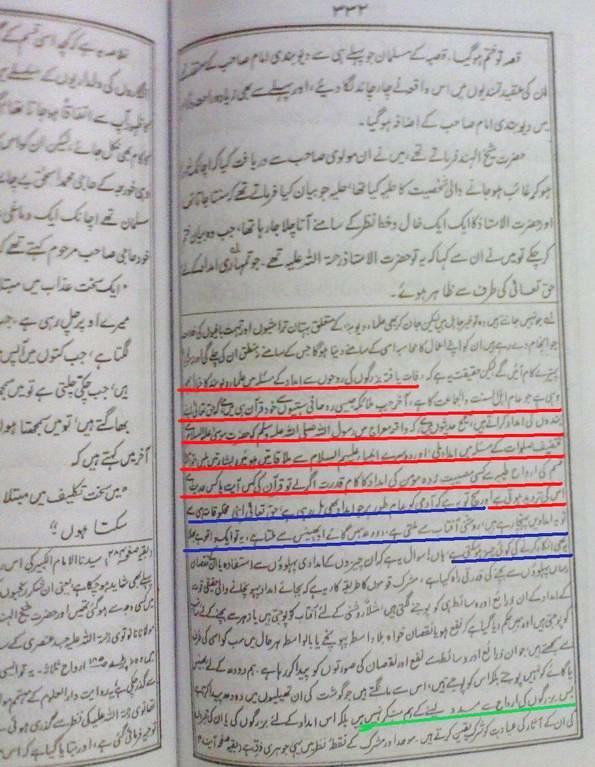 Founder of Deoband School Ashraf Ali Thanwi writes that Abu Yazid was asked concerning covering distances of the earth. Khwaja Azeezul Hassan has written a book by the name of Ashraful Sawaneh in three volumes on the occurrences of Ashraf Ali Thanawi’s life which has been published by Khangah Imdadiya Thana Bhoon District Muzaffarnagar. 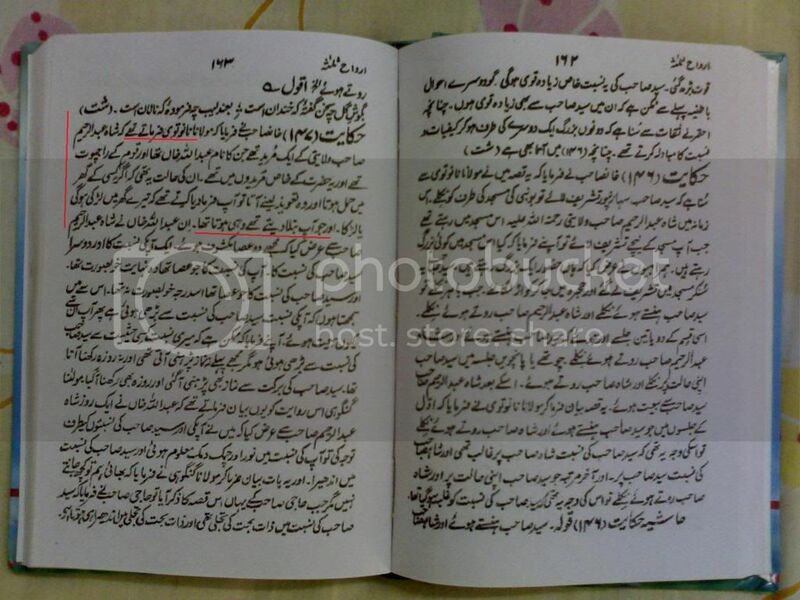 He has copied a very peculiar incident of Thanawi Sahib in his book. “After a long period of time a merchant narrated personally to me of his incident that, though as seen, Hadhrat (Ashraf Ali Thanawi) is sitting here yet who knows where he is at this very moment. Because, once despite Hadhrat being in Thana Bhoon I saw him in Alighar where there was an exhibition and was in heavy flames. I also had a shop in that exhibition. On the day when it was going to catch on fire, that very day against my usual habits there was a feeling of fear in my heart from the time of Asr. 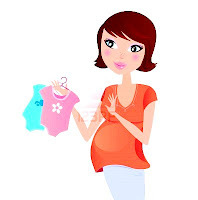 The effect of which was that despite it being a busy period for business I took all the fittings and merchandise of my shop before time and began packing them into boxes. 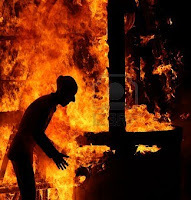 After Maghrib when there was chaos and confusion of the fire breaking up, then as usual being alone and the boxes being rather heavy I became alarmed that Oh God ! How am I to take these boxes out from the shop. Meanwhile what I saw was suddenly Hadhrat appeared and going to each and every box and said me to quickly pick them up. Accordingly he lifted on one side and I on the other side. In a short while each and every box was placed outside. The other merchants lost heavily from this fire, but with God’s blessings all my goods were saved. Dead Grand Father of Mawlana Asharf Ali Thanvee bringing sweets for his wife! “After his martyrdom he came to meet his wife (jinda tashrif laye) and gave sweet to his wife and said ‘ if you will not reveal this secret to anyone then I will come daily. The wife thought, what will other house member think when they will see her and kids eating sweets? But dead deobandi scholars can travel ! “The life of prophet sal allahu alaihi wa sallam in grave , is Hayate Barzakhi” ( Life in Brazakh) , in this life he ( sal allahu alaihi wa sallam) cannot travel ( from one place to another). 1) Mawlana Qasim Nanotvee comes from his grave to help a young Deobandi scholar . After helping this young deobandi scholar, Mawlana Qasim goes back to his grave. The outcome is , as per Deobandis, prophet cannot travel from his blessed grave, but ^Deobandi "akabir” can come and go as and when they want! 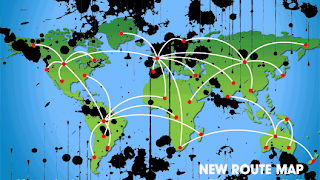 But this is not something new! 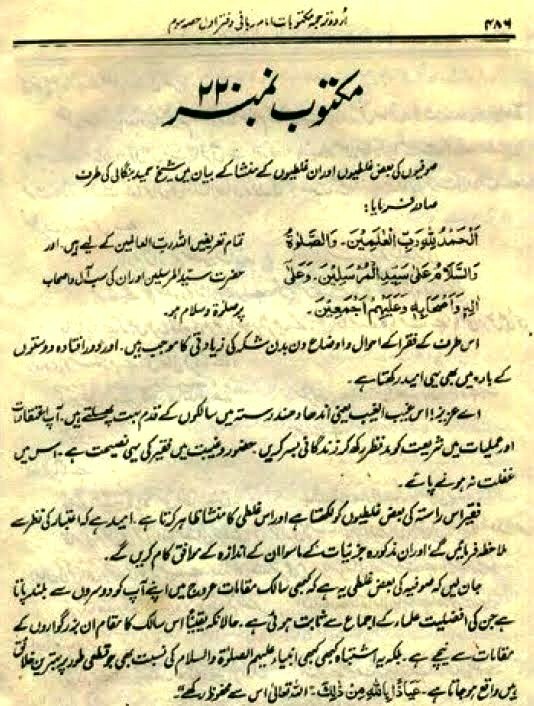 Reference - Qasim Nanotvi, Book 'Tahzeerannas (Tahdhir al Nas), page 5, published in Maktaba Fayz Nazd Jami Masjid, Deoband and also published from Kutub Khana Qasimi, Deoband publication. Mawlana Munazir Hasaan narrates a very strange incidence. He narrates that a few people were gathered in “chatta masjid ‘in Deoband. Mawlana Yaqoob (inchanarge, madarsa Deoband) was also present in that group. “I was about to die today morning, while I was performing salah. People asked him, what was the reason? He replied that , while he was reciting sura Muazammil, his heart was seized due to some “strange power” and his spirit ( ruh) was about to leave the body , but some how this condition passed very quickly. He continued and said that after performing salah he pondered over the whole incidence and it was told to him that durng that time ( when his heart was seized) Mawlana Qasim Nanotvee , who was in Merath ( another city) made “ tawaajjah ‘( concentration) towards him . Now how can I understand this strange incidence? I really need some Deobandi friend to explain me the whole matter. Mawalan Yaqoob , ( incharge Madarsa Deoband) really had an elevated stage! As soon as he finished his salah , he pondered over the issue and like a Satellite TV channel , everything was shown to him with in fractions. Forget about months, hours or minutes ,, he came to know with in seconds that Mawlana Qasim sitting in some other city did this ! But Deobandis should hang their head in shame. “ In many matters prophet used to make concenttarion, used to be worried and he used to be silent . In this incidence of ‘ Ifk ‘ ( Sayyeda Ayesha (RA) lost her ring and enemies of islam started speaking bad about her) prophet made “tawajjah” but he could not know anything. Only after 1 montn he was informed through ‘wahi’ (revelation). ( Hifzul Iman , By Mawlana Asharf ali thanvee page 7). When it comes to their “in house’ scholars , Deobandi belief is that they can know everything with their ‘tawajjaah” sitting at far away places. I ask each and every Deobandi , do you still need more evidences to prove that your scholars have indeed shown disrespect to prophet and have tried to lower his status and personality.? If we really fear the extreme heat on the day of judgment, on which sayyedul Anmbiya ( sal allahu alayhi wa sallam) will intercede for us, then let us stop praising those who have shown disrespect to our prophet. 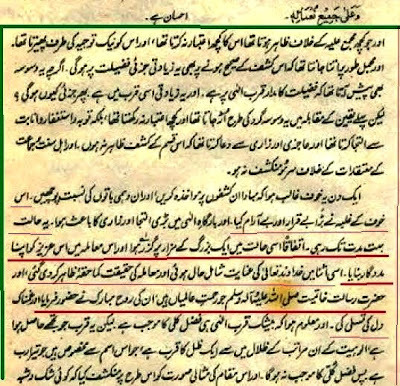 Thanwi Saheb's Honoured Khalifa Maulvi Abdul Maajid Daryabadi in his book "Hakimul Ummah" while writing a description of his gathering exposed those effects of his which are sufficient to startle those who have high regards for the deobandi Religion. "Hazrat himself, personally explained like this the description of certain elders that as if on the words of others. Our feelings and thoughts are being interpreted exactly. The heart said is he a Roshan Zameer (one who knows the matter of hearts) that all our hidden secrets and privacies are being reflected to him who can be a greater possessor of manifestation (Kashf) and miracles (Karamat). ^Read the last paragraph again. Here the entire situation is completely exposed. Moving away from ambiguities of metaphorical and figurative expression the word "Ghaib Dani" (knowledge of unseen) with respect to Thanwi Saheb has been used with complete perspicuity. 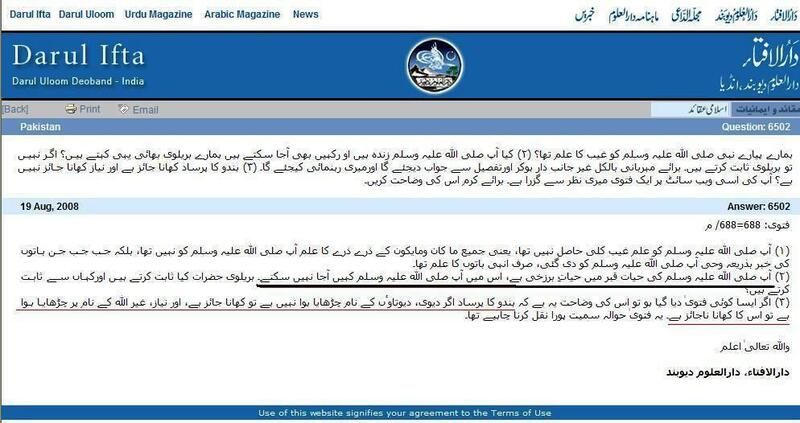 Deobandis have used ghayb for ashraf ali thanvi! 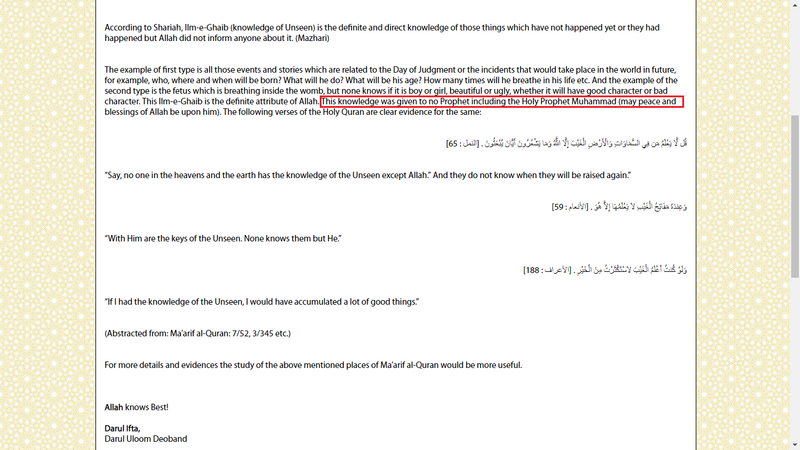 He had ghayb dani (knowledge of the seen) but Prophet [ sal allahu alayhi wa sallam] did not ! This is the true face of Deobandis! They show disrespect to our Prophet ( sal allahu alayhi wa sallam) and elevate their own cult scholars. They deny Quran, because Allah says in quran that Allah gives the knowledge of the unseen to those whom He choses , but deobandis do not accept this? 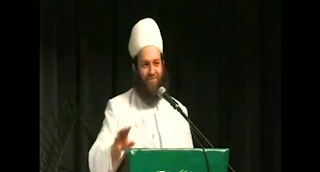 Mawlana Qasim Nanotvee narrates about one of the scholars of his group.